Mahesh Sosle, a first-year research scholar and a rank holder from MoU has been living in the hostel corridor for almost a month. Mahesh Sosle, at the college hostel corridor after being evicted by the authorities. 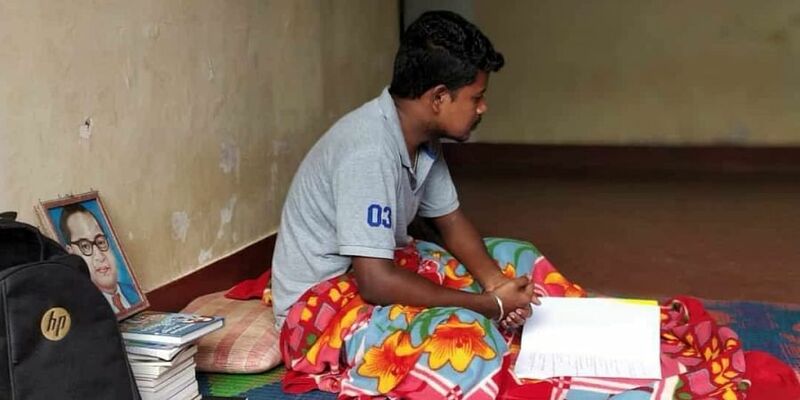 For the last one week, Mahesh Sosle, a PhD student at the University of Mysore has been forced to live in the corridors of the hostel after getting "kicked out" for pointing out irregularities in the administration. The scholar's name has been blacklisted ever since he led a march against the rampant corruption on campus. On August 18, he was asked to vacate the hostel by the Registrar Administration and on September 10, he was forcefully removed. "A couple of students and I, along with SFI members raised slogans against the Registar Administration and demanded basic hostel facilities for students such as a separate hostel for research scholars. We also questioned the irregularities in the appointment of the non-teaching staff and the faculties" says Mahesh, who is an active member of the Dalit Sangharsha Samiti and Dalit Students' Federation. On June 27, Vajubhai R Vala, the governor, had directed the university to terminate the appointment of 124 non-teaching staff and to file charges against former Vice-Chancellor Prof KS Rangappa, UoM Registrar Prof R Rajanna and Deputy Registrar Vishakanta. Since the authorities failed to pay heed to the students, Mahesh continued his struggle which further irked the authorities. On July 17, Dalit Vidyarthi Okkoota, UoM Research Students Association launched an strike in front of the Vice Chancellor’s office demanding immediate action against the trio. On August 18, Prof R Rajanna , Registrar Administration, instructed authorities to ask Mahesh to vacate the hostel premise.He was not served a showcase notice. Further, Prof Rajanna also filed an FIR under Section 353 (Assault or criminal force to deter public servant from discharge of his duty) alleging that Mahesh barged into his office. "They have completely cut off all my support. They are even denying me food and water but I am determined to continue my fight till they remove the charges against me," says Mahesh who is currently dependent on his friends and family for basic needs. Mahesh who joined the University for his Masters says that the authorities have been trying to stifle him previously as well,"Even when I was pursuing my Masters I was targeted quite often for my involvement in the Dalit movement on campus. When I was trying to get into the PhD programme, the college did everything they could to stop me from joining the institute," he said. This is despite the fact that Mahesh was awarded the gold medal for his Masters. When contacted, the college authority, Somashekar, Registrar of Evaluation efused to comment and denied that any such incident had occurred, "I do not have any information right now about this student," he said.